The sprawling cities which make up the backbone of modern society all start on the page of an architect. Successful planning and design of buildings requires the use of modern and useful tools. Tools that can provide accurate measurements and guarantee that buildings are able to jump from the page and into reality. If you’re involved in that design process, it’s important that you take the time to verify that your tools are up to the task. If you need a new architectural scale, then you also need to put in the effort to sift through all of the available options to pick the one which best serves your needs. Below, you’ll find a guide to some of the architectural scales which are available on the market and reviews which should help you select the right products for your demands. By using a scale which features all of the necessary measurements for your plans and which is sure to stand up to the rigors of daily usage, you can be sure that your job performance will exceed all of your prior expectations. Your firm and your career will benefit from accurate and detailed drawings which form the foundation for the kind of modern architecture that most designers crave. One of the first decisions that you need to make when picking out your architectural scale is determining which material best suits your needs. If your preference is for a wooden scale, then Woodrow’s 12-inch model is an excellent entry into the marketplace. Since it comes with a case for protection, you can be confident that the measurement marks outlining your scale will be long lasting and will remain visible even if your scale is constantly being moved in and out from your bag. The wooden construction also means that any accidental marking from architectural pencils will be easy to erase and clean, leaving you with the resilient tools that you count on to get the job done. Wooden scales are also lightweight, which is yet another bonus for architects who may frequently be on the go. As with any other wooden product, it’s important that you’re aware of the potential for some cracking or warping. Improper or incomplete care of your bag could cause a sudden fall which breaks your scale or leaves you otherwise struggling with chips and bends. If you frequently find yourself working on plans on a job site, extreme temperatures run the risk of causing some warping. Make sure that you consider your regular environment before investing in a scale that may be better suited to areas with slightly more control. In addition, the beveled ends may not allow for the kind of stability that some people prefer when drawing long and interrupted straight lines. Make sure that your technique is fully accommodated by your tools and consider working with a beveled edge before purchasing one. 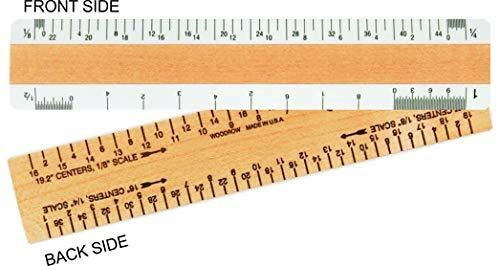 If you’re still feeling your way through the process of learning about architectural tools, then an entry level scale may be a great way to figure out whether or not you’re comfortable with a triangular ruler. 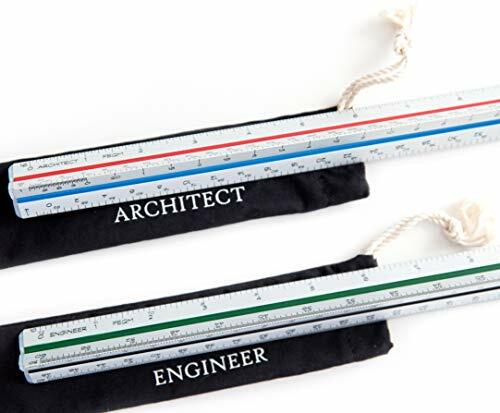 Most people learn to operate and draw with a ruler that sits flat against the page, but the triangular design of the Mr. 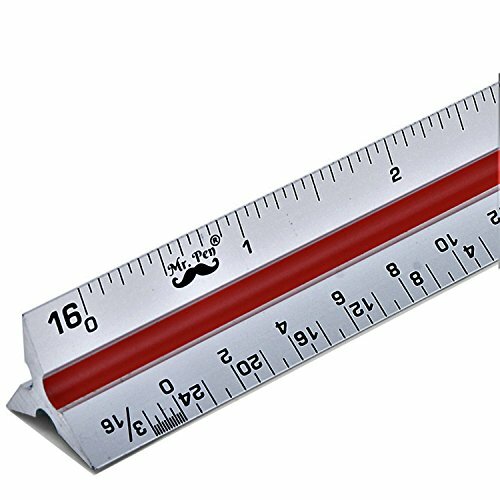 Pen scale allows for easy viewing of a wide variety of measurements. If your drawing requires to you to make constant adjustments or conversions, you might find yourself frustrated by constantly being forced to make calculations as you draft. Rather than surrendering to those frustrations, you can see a real benefit in using a triangular scale. Mr. Pen’s construction is metal rather than wood, so it can stand up to more harsh environments. However, the metal construction is also slightly heavier than wood, which may add some weight to your equipment bag. In addition, the sharper edges and increased weight may leave you in a position where your scale has the potential to be wielded improperly in the wrong hands. The measurements on each surface are measured and cut by a laser in order to guarantee maximum accuracy, and the aluminum construction should allow your scale to last for the duration of the time you’ll be using it. The color coding on each side of the triangular design also provides for a quick reference that should allow maximum accuracy. Rather than finding yourself frustrated by mistakenly using the wrong scale, you’ll have a constant reminder of where you are in the design process. Everyone’s eyesight has individual differences. If you’re easily distracted or otherwise put off by bright white paint, a black scale might provide the respite for your eyes that you need to guarantee extended performance. The architectural drafting process can take a great deal of time, and if you’re suffering from eye strain as you sit and work at your desk during the day, then you should look for design solutions. The white printed markings still provide the necessary contrast in order to be easily readable, but the white text on a black background has the potential to pop out and be more easily comprehended than black markings which might occasionally become blurry or difficult to focus on. Alvin’s entry model features a smaller profile than the comparable Mr. Pen scale, and so it may appear slightly more crowded as you’re attempting to ascertain specific measurements. Also, the hollow core of the Alvin scale helps to eliminate some of the weight that comes along with a metal scale, which should allow you to maintain the mobility and easy transport that most people want from their tools. Keep in mind that a black finish may make it more difficult to detect pencil or ink smudges which may end up on your scale through the process of drafting drawings. As a result, the potential for those strains to be transferred to your other work is perhaps higher than with a white scale. In order to maintain your scale for as long as possible, make sure that you regularly check for any residual marks which may remain on the surface. 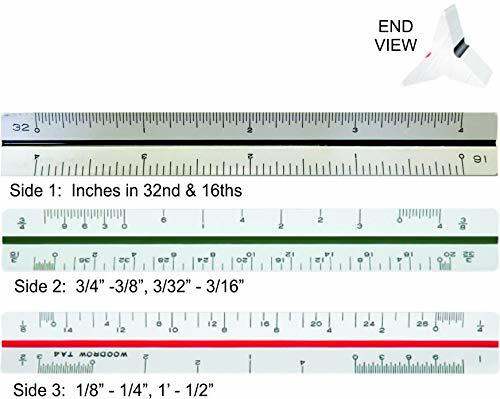 While most architectural scales come in a standard 12-inch variety, it’s also important to have the flexibility of having access to smaller tools in more intricate or difficult to navigate situations. Woodrow’s 6-inch model allows you to cover all of the potentially difficult parts of your drawing with accurate measurements which still guaranteeing the performance that comes with longer scales. This model also comes with an additional joist scale that allows you to examine not only larger scale architectural plans, but also individual pieces of structure which may need to be installed in order to successfully complete a project. This means that you can be active on the job site and cover the precise needs of a working crew without abandoning your drafting work, creating increased flexibility that should maximize your efficiency. Most of the drawbacks which come with other wooden architectural scales remain relevant to the 6-inch version as well. The shorter construction does make this model easier to fit into tight spaces and full bags, and consequently, it may be at less risk of being warped or broken due to difficult usage. The shorter version of the Woodrow scale also features the same beveled edges as the longer version, so the necessity of making sure that your technique fits with the tools remains. The primary benefit of these smaller models is their ease of transport and carry for site visits. If the size of your firm or the scope of your duties frequently requires you to be out in the field, then keeping a scale in your pocket can be a huge benefit. While that’s difficult to achieve with a 12-inch model, it can be done simply with the 6-inch variety. Color coding and visual cues are incredibly important when you’re working on a project that requires quick reference as you’re paying attention to details while drafting. As a result, the color coded sides of the All-Colors scale will allow you to quickly discern which measurements you’re working with in order to guarantee that you maintain consistency across the board as you draft your plans. As with other metallic, 12-inch scales, the size and composition of the metal scale represent rigid construction that should last for as long as you have a need. The measurements on each side of the scale are etched in to that metal, so even after extended usage, you should easily be able to read measurements under all circumstances without any concern that they may rub off. It’s also important to make sure that your scale won’t warp or fracture. Repeated use even under relatively calm conditions can pose that risk in some circumstances, so the etched markings on the All-Colors scale represent yet another way that you can be sure of accuracy and stability. The professional construction allows you to utilize this scale in an academic format and then keep it in your repertoire as you transition to having professional responsibilities. This means you can be consistent with the tools that you use and, consequently, you can develop repeatable results. This is an incredibly important characteristic to have when you’re working in a field which demands excellent and accuracy under all possible stresses and conditions. In a collaborative design process, both architects and engineers will play a role in contributing to the design of a structure and checking their work against the specs provided by the client. In order to make sure that those cross checks are performed accurately and without any confusion, it’s essential to make sure that all the necessary steps are taken to guarantee consistency of measurement. One way to lock in that consistency is to buy architectural scales in a set, and this set of two scales achieves that goal. The rugged metallic construction and etched markings will, as with other products, stand up to difficult environments. However, in addition to that rigidity, you can be sure that two tools will deliver identical markings in order to guarantee that your measurements are never in doubt. 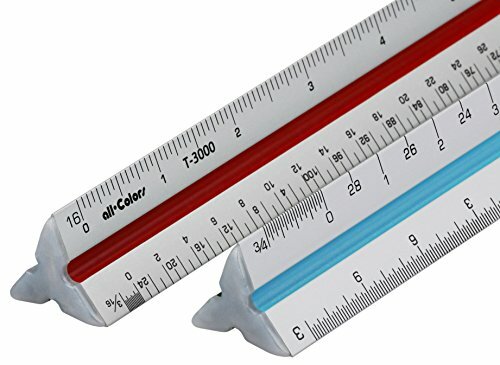 This set of two scales comes with protective sleeves that helpfully label which scale is to be used by the architect and which by the engineer. This guarantees not only consistency between the two scales, but also consistency in terms of which is used by which person. This helps to minimize the risk of human error by guaranteeing that each person is comfortable with the tools they’re required to use in order to get the job done. Also, given that many engineers find themselves having to deal with metric conversions in order to adjust measurements into the necessary standard units, having an engineer’s scale that includes imperial measurements can provide a real benefit. Cutting out conversions means cutting out potential mistakes as well as time, allowing you to complete your designs with the efficiency and accuracy that your clients expect. While metal and wooden products are generally prominent through the marketplace, the use of plastics also provides for some options when you purchase your scale. The flapped pouch that comes with this scale provides protection from accidental damage that may occur during transport, guaranteeing that the markings will remain visible for as long as possible. As with the black metal scale, plastic may be more susceptible to holding ink or graphite than other materials. As a result, it’s important that you take time to clean your scale on a regular basis while simultaneously guaranteeing that you don’t accidentally damage any of the visible markings through rubbing or scratching. Having access to the benefit of three sided scales, without the downsides of metal can make a plastic scale incredibly popular. While plastic is at risk of warping or cracking in the same way that wood may be, use under the proper conditions should prevent you from having to replace your scale before you’re ready. In addition, the color coded side design offers the same benefits as other products which carry that design feature, guaranteeing that one quick look will allow you to verify that you’re working in the proper scale for the project at hand. Additionally, the highly compact design makes it yet another product that’s ideal for carrying on job sites and use in practical applications that otherwise might be difficult with a long, heavy scale thbat doesn’t offer the same amount of mobility.